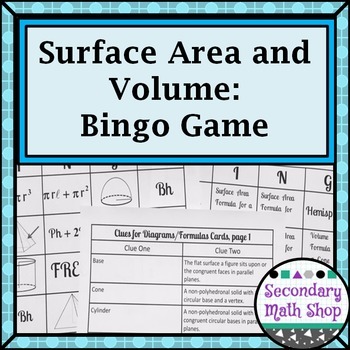 Surface Area and Volume BINGO Game! 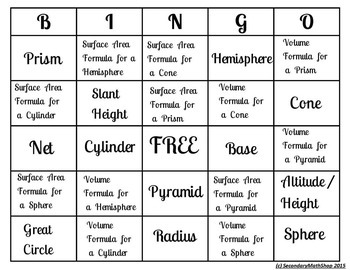 Surface Area and Volume Geometry Surface Area and Volume BINGO Game! A Teacher Description page that includes the above information and a set of cover squares. I recommend this game as a fantastic way to practice the vocabulary, to reinforce important beginning concepts before a test, as a way to use some down time before a break without giving "free time". Multiple ways! Quick Reference SheetGeometry Surface Area and Volume Figures and Formulas Quick Reference Sheets. Geometry Surface Area and Volume of Pyramids Riddle Worksheet . 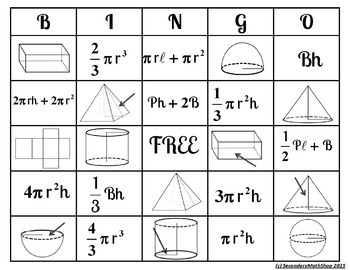 Geometry Surface Area and Volume of Cones Riddle Worksheet . Geometry Surface Area and Volume of Spheres and Hemispheres Riddle Worksheet. Geometry Surface Area and Volume of Cylinders Riddle Worksheet. Geometry Surface Area and Volume of Prisms Riddle Worksheet. Surface Area and Volume of 3-D Figures Wall Posters and Graphic Organizer. Geometry Surface Area and Volume Bellwork/Exit Cards Station Questions .